Newborn jaundice occurs when a baby has a high level of bilirubin in the blood. Bilirubin is a yellow substance that the body creates when it replaces old red blood cells. The liver helps break down the substance so it can be removed from the body in the stool. A high level of bilirubin makes a baby's skin and whites of the eyes look yellow. This is called jaundice. It is normal for a baby's bilirubin level to be a bit high after birth. When the baby is growing in the mother's womb, the placenta removes bilirubin from the baby's body. The placenta is the organ that grows during pregnancy to feed the baby. After birth, the baby's liver starts doing this job. It may take some time for the baby's liver to be able to do this efficiently. 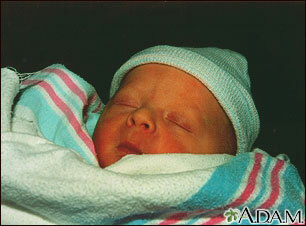 Most newborns have some yellowing of the skin, or jaundice. This is called physiological jaundice. It is often most noticeable when the baby is 2 to 4 days old. Most of the time, it does not cause problems and goes away within 2 weeks. Two types of jaundice may occur in newborns who are breastfed. Both types are usually harmless. Breastfeeding jaundice is seen in breastfed babies during the first week of life. It is more likely to occur when babies do not nurse well or the mother's milk is slow to come in. Breast milk jaundice may appear in some healthy, breastfed babies after day 7 of life. It is likely to peak during weeks 2 and 3, but may last at low levels for a month or more. The problem may be due to how substances in the breast milk affect the breakdown of bilirubin in the liver. Breast milk jaundice is different than breastfeeding jaundice. Babies who are born too early (premature) are more likely to develop jaundice than full-term babies. Jaundice causes a yellow color of the skin. The color sometimes begins on the face and then moves down to the chest, belly area, legs, and soles of the feet. Sometimes, infants with a severe jaundice may be very tired and feed poorly. Health care providers will watch for signs of jaundice at the hospital. After the newborn goes home, family members will usually spot the jaundice. Any infant who appears jaundiced should have bilirubin levels measured right away. This can be done with a blood test. Many hospitals check total bilirubin levels on all babies at about 24 hours of age. Hospitals use probes that can estimate the bilirubin level just by touching the skin. High readings need to be confirmed with blood tests. Further testing may be needed for babies who need treatment or whose total bilirubin level is rising more quickly than expected. Treatment is not needed most of the time. A baby will need treatment if the bilirubin level is too high or is rising too quickly. Feed the baby often (up to 12 times a day) to encourage frequent bowel movements. These help remove bilirubin through the stools. Ask your provider before giving your newborn extra formula. In rare cases, a baby may receive extra fluids by IV. Some newborns need to be treated before they leave the hospital. Others may need to go back to the hospital when they are a few days old. Treatment in the hospital usually lasts 1 to 2 days. Sometimes, special blue lights are used on infants whose levels are very high. These lights work by helping to break down bilirubin in the skin. This is called phototherapy. The infant is placed under these lights in a warm, enclosed bed to maintain a constant temperature. The baby will wear only a diaper and special eye shades to protect the eyes. Breastfeeding should be continued during phototherapy, if possible. In rare cases, the baby may need an intravenous (IV) line to deliver fluids. If the bilirubin level is not too high or is not rising quickly, you can do phototherapy at home with a fiberoptic blanket, which has tiny bright lights in it. You may also use a bed that shines light up from the mattress. You must keep the light therapy on your child's skin and feed your child every 2 to 3 hours (10 to 12 times a day). A nurse will come to your home to teach you how to use the blanket or bed, and to check on your child. The nurse will return daily to check your child's weight, feedings, skin, and bilirubin level. You will be asked to count the number of wet and dirty diapers. In the most severe cases of jaundice, an exchange transfusion is required. In this procedure, the baby's blood is replaced with fresh blood. Giving intravenous immunoglobulin to babies who have severe jaundice may also be effective in reducing bilirubin levels. Newborn jaundice is not harmful most of the time. For most babies, jaundice will get better without treatment within 1 to 2 weeks. A very high level of bilirubin can damage the brain. This is called kernicterus. The condition is almost always diagnosed before the level becomes high enough to cause this damage. Treatment is usually effective. Infants who spend less than 24 hours in a hospital should be seen by age 72 hours. Infants who are sent home between 24 and 48 hours should be seen again by age 96 hours. Infants who are sent home between 48 and 72 hours should be seen again by age 120 hours. Jaundice is an emergency if the baby has a fever, has become listless, or is not feeding well. Jaundice may be dangerous in high-risk newborns. Talk with your baby's provider if you have questions. In newborns, some degree of jaundice is normal and probably not preventable. The risk for serious jaundice can often be reduced by feeding babies at least 8 to 12 times a day for the first several days and by carefully identifying infants at highest risk. All pregnant women should be tested for blood type and unusual antibodies. If the mother is Rh negative, follow-up testing on the infant's cord is recommended. This may also be done if the mother's blood type is O positive. Muchowski KE. Evaluation and treatment of neonatal hyperbilirubinemia. Am Fam Physician. 2014;89(11):873-878. PMID: 25077393 www.ncbi.nlm.nih.gov/pubmed/25077393. Rozance PJ, Rosenberg AA. The neonate. In: Gabbe SG, Niebyl JR, Simpson JL, et al, eds. Obstetrics: Normal and Problem Pregnancies. 7th ed. Philadelphia, PA: Elsevier; 2017:chap 22.